PROS: Syncables 360 is great for data transfer, whether it is from computer to computer, or phone to computer, it will certainly fit your needs. CONS: There doesn’t seem to be any way other than email for you to contact the personnel with Syncables with any questions or problems you may have. 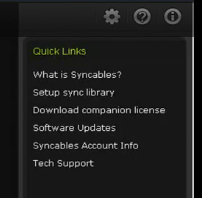 OVERVIEW: Syncables 360 is a great product overall and very easy to use. You should have no problems transferring your data from one place to another. Syncables 360 is a useful tool for those who have more than one computer system running various operating system at home. Send data to another device, or your phone as well as from the phone to a computer or laptop. Either a wireless or wired network is supported. Manual or automatically synchronize your data files. The user menu is simple and straightforward as shown in their Quick Links Menu. automaticatlly sync that system to others detected within the Synchables linked group. Data can be synchronized from whole folders or specific files within folders. If the system encounters two files with identical names, it will present the user a dialogue box to select how to resolve the conflict. These settings can be changed from the preferences menu. Besides the standard data files and folders, synchronization can be completed for Outlook Express, Thunderbird, or Windows mail. Audio and video files can be synchronized. The system provides steaming audio from a compputer to your phone. Backups can be done to external US drives or other portable storage devices. For those with Facebook, Flicker, and You Tube accounts, sending your files automaticatlly is an easy task. Just click on the link to social media, choose your service, login and upload. All computers require the Synchables 360 application installed via a “.exe” for Windows computers, “.dmg” for Macintosh and “.bin” for Linux systems. To utlilize this package, a computer novice will have no issues operating this software. I found this aspect of the software frustrating. All support is provided strictly from email correspondence with the company helpdesk. There are no phone numbers found anywhere on their website. There are three main versions of this software: Syncable 360 allows 3 computers and a phone. There is 360 Home Network that supports 5 computers and phone. The last version is called 360 Workgroup and is avaiable for businesses who need large numbers of systems to be synchronized. Additional licenses are available for purchase. Overall Synchables 360 can be useful for home computers or a work laptop that needs additional data protection. With mobile support phone contacts, emails, are easily sent to a home computer for safe data storage. Having family photos, emails, and videos quickly sent to social media sites is handy as well. However, business users may be better suited by selecting a product with a more enhanced technical support program.